Subscribe to get our latest healthcare marketing eBooks, reports and whitepapers in your inbox at the end of each month. It's totally free! 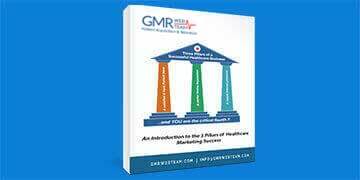 Free healthcare marketing resources that include our expertise repurposed into eBooks, whitepapers, reports and insights. For the success of your healthcare practice, you need the right knowledge and plan of action backed by proven marketing strategies. This white paper explains the 3 pillars of healthcare business which have been devised from our best practices developed by working with healthcare clients. In this whitepaper, we share specific strategies that you can employ to convert your prospects into your patients. The tips laid out will help you manage your online reputation along with supporting you to execute an outreach program for increased referrals and generating more recommendations for your healthcare practice. Marketing a healthcare business is way different from marketing any other business! No healthcare business can achieve a focused growth without improving on their patients’ experiences and patient satisfaction level. This comprehensive healthcare digital marketing guide will provide you with seven best ways to improve your patient acquisition rate. There has been a change in the way patients are reviewing their healthcare experience. As a primary care physician, you should understand the needs of your patients so you can address their pain points. This report shares useful insights on patient satisfaction and reviews. It's important for urgent care centers to understand patient sentiment so they can improve patient satisfaction and attract more patients. This report shares important insights and trends in patient reviews that will help urgent care centers improve patient care and satisfaction. As a dentist, it's important for you to develop a strong bond with your patients so they can become your advocate, bringing in more referrals. This report measures the loyalty of your patients so you can understand and address their pain points for improving satisfaction.